We know the jolly old man, who rides a sleigh to bring us gifts, as Santa Claus but to Italians they know someone else...her name is La Befana. She is a good witch who rides on her broomstick to deliver gifts to good girls and boys after Christmas, on January 6. It was said that the three kings told her that baby Jesus was born but she was too busy and her trip to visit him was delayed. She missed the bright shining star and lost her way and has been flying around ever since (just like Santa Claus is always watching) leaving presents for the good girls and boys and a lump of coal for the bad ones. The Italian Christmas season is celebrated for 3 weeks and is filled with traditions for families and children. Some similar to American traditions and some not. The celebrating starts 8 days before Christmas and is called Novena. Children go from house to house reciting poems and singing. In some parts shepherds bring musical instruments into the villages, play and sing Christmas songs. A strict feast is observed for 24 hours before Christmas Eve, and is followed by a celebration meal, in which a light Milanese cake called panettone features as well as chocolate. Presents and empty boxes, are drawn from the Urn of Fate - lucky dip, which always contains one gift per person. By twilight, candles are lighted around the family crib known as the Presepio, prayers are said, and children recite poems. At noon on Christmas Day the pope gives his blessing to crowds gathered in the huge Vatican square. In Italy the children wait until Epiphany, January 6, for their presents. 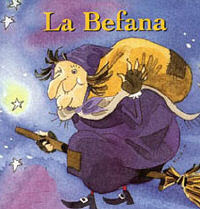 According to tradition La Befana, a good witch, delivers them on her broomstick to all the good girls and boys.